The circulatory system is one of the most important systems of the human body that permits the blood to circulate and transport the nutrients to and from the cells of the body. It provides nourishment to the body and helps it fight diseases and maintain the health of the body. The circulatory system is also known as cardiovascular system and heart is the central organ of this system. The cardiovascular system consists of the closed circuits- the heart, arteries, veins, arterioles, capillaries, and venules. 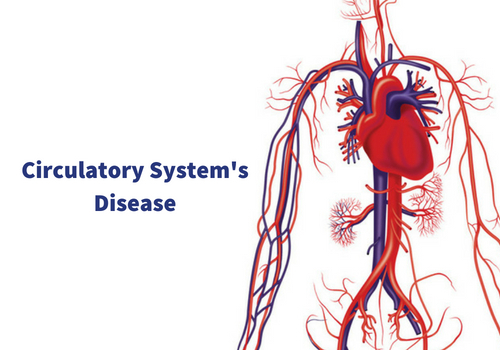 Many diseases affect the circulatory system and some of them can cause major complications. An aortic aneurysm is an abnormal widening of the section of the aorta. It is the main artery that supplies oxygen rich blood from the heart to other organs of the body. It can occur in the lower part of the aorta, in the abdomen or it can occur in the upper part of the aorta, in the chest. When it occurs in the chest, it is known as thoracic Aortic Aneurysm and when it occurs in the abdomen, it is known as an abdominal aortic aneurysm. There are many factors that can lead to the weakening of the aortic wall and increases the risk of an aortic aneurysm. Smoking, advancing age, high blood pressure and atherosclerosis are some of the factors that contribute to the development of this disease. It weakens and damages the inner surface of the aorta which causes this disease. The word prolapse means the displacement of the organ or the part of the organ from its actual position. Displacement of an abnormally thickened mitral leaflet into the left atrium during systole is considered as a condition of mitral valve prolapse. It is also known as floppy mitral valve syndrome, billowing mitral leaflet, and systolic click murmur syndrome. There are various pathogenic factors that cause abnormal enlargement of one or more portions of the mitral valve. Mitral valve prolapse is divided into two forms and these are based on the thickness of the leaflets. Classic form - Prolapsing valve with leaflets whose thickness are more than 5 mm belongs to the classic form. Severe cases of classic mitral valve prolapse carry a high risk of complications. Non-classic form - Prolapsing valve with leaflets whose thickness are less than 5 mm belongs to non-classic form. It carries a low risk of complications. Varicose veins are commonly known as the veins on the legs and it is characterized as a condition in which the veins become enlarged and twisted. It is a progressive disease and it can occur at any age but it mostly attacked a person in the twenties. According to the studies, females are more likely to be attacked by this disease as compared to the males. Tingling, itching, pain, and tiredness are some of the main symptoms that are associated with varicose veins. Varicose veins can be more painful especially when standing. Standing for the longer duration can lead to swollen legs, skin thickening, and ulceration. Atherosclerosis is a disease which occurs due to the buildup of plaque and this plaque leads to reduced or blocked blood flow. In this condition the inside of the arteries narrow and forms plaque. It is also known as hardening or blockage of arteries. Under this condition, high pressure blood vessels that carry blood from the heart to the rest of the body is affected. The partial blockage of an artery in the heart can cause chest pain and if there is a complete blockage, it can lead to a heart attack. Along with the arteries of the heart, atherosclerosis can also affect the arteries of the brain, kidney, and legs. There are many risk factors that are associated with the development of atherosclerosis and some of them include high blood pressure, smoking, insulin resistance, and advancing age. Atherosclerosis is said to be the biggest cause of peripheral arterial disease. Most of the people who suffer from a peripheral arterial disease caused this disease due to atherosclerosis. It is the most common cause of this disease but there are other risk factors as well. Other factors that can lead to the development of peripheral arterial disease are diabetes, hypertension, and smoking. It is a disease which is defined as a narrowing of the arteries other than those that supply blood to the heart and the brain. It can affect any artery but the arteries of the legs are commonly attacked. Circulatory system plays an important role in the human body and everyone should be aware of it. Share it with your family and friends and create awareness. Stay Safe, Stay Healthy! !